Mia: Welcome back to another episode of Paws and Play with Dr. J. I'm your cohost, Mia, and we've got Dr. J here with us. How you doing? Dr. J: I'm doing great Mia. Thank you. How's everybody else doing? Dr. J: Ha, I'm like trying to talk to the audience. So it was like, well, they're not going to answer me. Mia: Yeah, that'd be a really sad conversation. Dr. J: Why is nobody talking to me? I get no respect. Me and Rodney Dangerfield. Mia: Well I'm glad I could actually be on the other side of your conversation and things are going pretty well here. It's kind of interesting because on today's episode, we're going to be talking about keeping our pets cool when things are heating up. Dr. J: Give it an hour. Mia: Right. I mean, yeah, that does actually happen here. But either way, it doesn't even take it being incredibly hot, it doesn't even have to be in the nineties or above for things to go downhill. Dr. J: We can see heat stroke, we could see heat-related problems at 70–degrees. Mia: So wow, that's actually shocking to me. So yeah, so this is obviously a really important conversation, especially with the summer coming up. And some areas of the US have already gotten into the hundreds. So now is the time to get great tips on keeping our pets cool. And, and not just dogs but cats as well. From a vet's perspective, what do you see? I guess walk us through a little bit of heat stroke. Dr. J: So, you're right, we do get, obviously a large number of cases in the summer, but we also do get them in the spring and in the fall because people tend to let their guard down and then we get these sort of unseasonably warm days. But basically, heat stroke itself is defined as heat exhaustion plus involvement of the central nervous system. So oftentimes we'll see dogs that have a decreased mentation. They're not as alert. Maybe they have collapsed, maybe they've had seizures, maybe they are mentally obtunded. Mia: Obtunded? That's a fancy word. Dr. J: It's a good word right? Dr. J: No, that's why I throw it out there because it pretty much just ends of the conversation. So normally thanks, Mia. No, obtunded basically just means that their level of consciousness, their ability to respond to things that they normally do, like if you whistle to get their attention or snap to get their attention normally, or call their name, they're not really as responsive or they're just not responsive. So just sort of like more mentally dull and that could be an indication that we've got involvement in the central nervous system and we've progressed into an extremely dangerous areas far as temperature. Mia: And that's important to make note of, because it's not just physical symptoms to be looking out for. It sounds like you just really need to know your pet, and know what's normal for them. Dr. J: Yeah, and recognize the changes, because they can be subtle initially. You know, things even just if you're out for a walk and they're just going more slowly. Or they're wanting to stop for more frequent breaks, or they're seeking out shade, things of that nature. And then also knowing how to check their pulse. Because if you know what's normal for their pulse in terms of feel and pulse rate, then if you're worried that maybe they're overheating and you'll feel for their pulse and it's really rapid and maybe a little bit thready — so it's not as sort of smooth. And the more you feel that, the more you get used to what's normal, the more you more easily you can recognize abnormal. Then that can also be an indication that their cardiovascular system is having to work harder and it may be related to the heat and the exhaustion. And so you can take preemptive steps and precautions to help decrease their risk of progressing further down that very dangerous rabbit hole. Mia: Well I have a hard enough time finding my own pulse. Dr. J: It can actually be easier on cats and dogs sometimes. So people should talk to their vet or one of the veterinary nurses at their practice, and they can show them how to find the pulse on their dog. Mia: Great. Which actually, that brings up a great point that I don't know if we have mentioned on our podcast before, but there are definitely certain things that ,if you are unsure of how to do something, you should always feel welcome, whether or not your vet is open to answering is another story, but you should always feel welcome to ask your vet to show you how to do things. Dr. J: Demonstrate. Yeah. And, most vets and most veterinary nurses would be psyched to show people. Because we love it when people are really excited about taking the best care of their pet possible and getting to recognize early warning signs. So definitely if you've got questions, ask for that. Ask your veterinary technicians, nurses about how to check the temperature on your pet, how to check the pulse rate. How to count their respiratory rate. Check their gums for their capillary refill time. So speak to the people at your veterinary practice, or veterinary hospital. Take a pet first aid course. There's a bunch of those out there. We've got a link on the website or resource for people to find a pet first aid course near them. Then you can also do YouTube searches. There are some good videos that walk you through doing those things, several of them produced by veterinarians for their clients, that are just freely available on YouTube. So definitely, it's a good thing to learn. Mia: Maybe we can even post some of the YouTube videos that you recommend because there's still a lot of crap out there. Dr. J: There is, there is. Yeah. Yeah, we can provide some links. Mia: Why don't we go right into what some of the factors of increased risk might be? Dr. J: So, one thing especially, summer time's coming up, kids are getting out of school. So maybe a lot of people are getting new puppies or kittens. As a general rule of thumb, puppies regardless of breed, all other things being equal, puppies in general are just not as adept at regulating their body temperature. So puppies and kittens, all other things being equal are at increased risk of heat-related illness. We've got to be extra careful with them. Fortunately there is a growing awareness, hopefully, about the dangers of brachycephalic pets. So those are the ones with the little smushy faces that are ridiculously cute. Mia: Thank you for including the ridiculously cute part. Those are my smushy faces, I've got my smushy dog and my smushy cat. Dr. J: Yep. They are ridiculously cute, but unfortunately they are also prone to a lot of medical issues. Just full stop and increased risk of heat-related illness is definitely one of them. For one because they've got their shorter nose, they've got the shorter muzzle. So they, it's the cooling effect of the air sort of coming through. Hot air, coming through into their lungs is diminished because they have less surface area to cool. But also a lot of these dogs and cats have narrowed nostrils. So if you look at, say Frenchies, I know you've got a Frenchie, but if you look at a Frenchie, a Bulldog, a Pekinese, a Shitzu, and then also with cats, so your Himalayan, Persians and the mixes of these. If you look at their nostrils compared to say on the dog side, a Labrador or a St. Bernard or you know, even a smaller, like a Chihuahua or a Corgi, you'll notice that typically the nostrils on the brachycephalic dogs are significantly more narrow. Well, that's like going scuba diving and trying to breathe through basically a cocktail straw as opposed to a regular size straw, or in the case of some of these larger dogs, the jumbo straws from McDonald's. But you know, trying to breathe through a cocktail straw would be devastating and stress inducing and significantly less efficient than breathing through a much larger straw or an actual snorkel. I guess if we're talking about scuba diving, it's a regulator, but let's go switch it to snorkeling. So brachycephalic are at increased risk generally regardless of their age. But speaking of age, similar to puppies and kittens, older adult, senior geriatric dogs and cats are also at increased risk because they typically have worse body condition. They don't have as much insulation and muscle to sort of help protect them, but also they have a diminished ability to regulate their body temperature as well, oftentimes owing to medical conditions that they have, whether that be thyroid dysfunction or a variety of other of other issues. Other things would be dogs or cats with preexisting respiratory conditions. We're talking about medical issues. So, older dogs — and Labs tend to get it. There's a condition called the Laryngeal Paralysis where you notice your dog's sort of roaring a bit more. It's actually a condition in horses as well, it's called "Roars." So if you have a horse, you kind of probably know what I'm talking about. But if you notice that your dog's bark is changing, they're getting older, they're breathing a little bit more heavily, have them evaluated. Talk to your vet about that, because it may well be Laryngeal Paralysis and that increases their risk tremendously for heat-related illness as well as other quality of life issues. A collapsing trachea is a problem that's more common in smaller dogs like little Terriers and Chihuahuas and whatnot, where they'll do sort of like a goose honking cough because their trachea actually collapses into itself. Their trachea or wind pipe, is what they breathe through, so if they're not breathing well and then they get panicked, and then they breathe even less well, and breathing and panting is the primary way that dogs cool themselves off. That increases their risk tremendously as well. You also have dogs and cats that have chronic bronchitis or cats that have asthma. Mia: So, would a cat or a dog that is experiencing allergy symptoms also be more at risk? Dr. J: So I would say yes, depending on how severe their allergies are. So if they're all snotty and congested in their nose, then definitely because they're going to be having to work much harder to breathe generally, because they're all stuffed up. And so that's gonna inhibit, to some degree, and diminish their ability to cool themselves off. So yeah, I would say that there's a distinct risk of it. If they're fairly mild allergies, probably not as much, but still good to be on the safe side. Mia: Sorry, I got a slightly off topic I suppose. Dr. J: No, no. That's the point of this, right, is not just for me to lecture and ramble on, I like to ramble, as you know Mia, so no, fire away with questions. Mia: Back to scuba diving. No, I'm just kidding. You know, I'm not somebody that has ever scuba dive, but I have had a few cocktail, uh, not a few cocktails today, but straws in my life. And, you know, thinking about it that way I think is a really good comparison. And it's obviously something that most people can probably be able to picture. Dr. J: Well, and it is important. I mean, we have, you know, I'm obviously a little bit biased, but I think we've got a great article on the website about brachycephalic syndrome and cats and dogs and it really is a crucial thing for people that have brachycephalic pets to be aware of. Because there are certain steps that you've got to be aware of that you should take, and depending on how severe their condition is, there are surgical procedures that can help to correct some of these issues. Mia: I'm a French Bulldog page on Facebook, one of probably millions, and there's a lot of dogs going in for nares surgery to open up their nasal passages, and it looks like it's doing a ton of good. Dr. J: Yeah. And that's part of it. That's part of the procedure. There's also, because they tend to have what's called an elongated soft palate, which kind of dipped back into their windpipe when they breathe in. So surgically, that could be shortened and that can help tremendously as well. But these are things to talk to your vet about and not all vets, and not all general practice vets are comfortable with doing and are experienced enough to really do it. Plenty are, but you could also go visit a board certified veterinary surgeon. At my alma mater, — give a shout out to the Royal Vet College over in London — It's such a big problem over there that the RVC has actually created a brachycephalic clinic. They have a group of people, specialists and general practice vets that are so focused on brachycephalic syndrome, and the conditions associated with it, that they have a whole clinic that's dedicated to helping these pets live better lives because it's a huge quality of life issue and safety from a, from the early death standpoint. Mia: So some other things. Marshall is still trying to get rid of some winter weight just like myself. And you know, that's something that keeps me warmer too. I mean, I usually am like, summer's coming, I lose weight a little bit more naturally anyway. Dr. J: Well, we get out, we exercise more, things of that nature. We've got up here in the Pacific Northwest, we have more sunlight, so hopefully we're feeling a little bit better. We're not doing as much, you know, downer eating — my guilty pleasure is eating generally. So yeah, I mean excessive weight and obesity, which actually is an epidemic in this country for pets, and Dr. Ernie Ward has done some great work with his own pet obesity prevention organization. I can't remember the exact name, but he's done some phenomenal work with surveys to find out, both from the standpoint of how obese or overweight pets are in this country, and also how few people realize when their pets are actually overweight or obese. And so it's not the type of thing, most people don't look at their pets and go, yeah, they're a little bit overweight or they're obese. They go, oh, they're a healthy weight, right. We always talk about like fat cats and like puppy dogs, they're cute or whatever, but it's dangerous. So again, working with your vet it, looking at Dr. Ward's information on his site, really working to get that weight down. I mean definitely for the heat safety, but also just general quality of life because if they've got arthritis, which a lot of cats and a lot of dogs do, and especially cats are under-diagnosed with arthritis and people just don't realize it because they're typically not a huge athlete so it can be more subtle. But if they're carrying around extra weight, that's really painful on their joints. And for a cat who typically weighs around 10 to 12 pounds, if they're overweight by a pound, that's 10 percent of their body weight. I mean I'm pushing 200 pounds, that would be me carrying around an additional 20 pounds. It's not insignificant. So working on the weight definitely is important. And then dogs get a condition or hormonal imbalance called Addison's disease where they really can't deal with stress and these dogs are at increased risk of heat-related illness because their body can't react the way that it should. Working with your vet, having their annual wellness exam, a year, sometimes twice a year, depending on how old they are and what conditions they have. And asking your vet specifically like, do these conditions increase the risk for "enter your condition here." 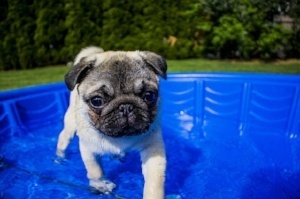 Do these conditions increase my pet's risk for heat-related illness in the summer or does it increase their risk for problems say when they're traveling or whatever it might be. Talk to your vet, if your pet's diagnosed with a condition, ask what it increases their risk for and what you can do to mitigate and minimize those risks. Dr. J: No, and you're restricted because you really can't do middle of the day exercise. You might not be able to go for as long of a walk as you normally might. If I'm not mistaken, I think we have an article on the site about exercising indoors for pets when the weather's bad and usually we think about snow, ice, rain, things of that nature. But it could also include when it's too hot out. Mia: Absolutely. Actually, I think I posted that article to Facebook not long ago, specifically with the heat coming up and of course the rain in mind. Dr. J: But I know there are more and more towns with swim centers popping up, indoor swim centers where dogs can go swim. And whether it be guided or a little bit more of a free for all — there's a great video I always see circulating around Facebook, I think a bunch of Goldens are in a pool. Some town turns it over to the dogs, which just is fun — although probably not fun for them cleaning the filter. But swimming is an amazing exercise for people and also for dogs, and cats if you can convince them to do it, which there are some that do. But it's an amazing exercise because they burn a lot of calories. It's super low impact on their joints. So for dogs that are suffering from arthritis that maybe you know, that can't go out and run or walk or hike for miles on end, they can typically swim for, you know, several minutes, maybe an hour depending. So swimming can be great exercise. There's lots of things that you could do from the exercise component, but also from the feeding component, you could slow down the rate at which they eat, you can give them fewer treats, break treats in half, and there's all kinds of things. Maybe we're going to have to do a podcast on obesity. Mia: I think that would be a great idea. So let's take a pause really quickly just to remind people, you can always find us at preventivevet.com and you can find the archives for all of our podcasts on iHeartRadio, Apple Podcasts, Stitcher, Google Play, and of course at our website at preventivevet.com/pawsandplay. And you can sign up for our newsletter while you're there. Also, ask us a question. Well don't ask me because I am not the expert, but send your questions and I'll get them answered. Dr. J: You're the expert at keeping me in line here, which is very important. Mia: I don't know how good I am at that, but I'm trying. Dr. J: It's a hard task. Mia: So we've talked a little bit, when you mentioned briefly, not being able to really take our dogs out for longer walks or cats I guess during the afternoon when it's really getting heated up. So you know if we can manage to save our longer walks for early morning and in the evening when it cools down, that's probably better. But let's talk about some other tips for keeping them cool. And I guess maybe we should break things up maybe by thinking about things that should be supervised versus unsupervised because I think there's probably more things that we can do if we're around to keep an eye on them, but there are plenty of things to at least try when we can't keep our eyes on them. Dr. J: Well I think, I guess when we can't keep her eyes on them — so you mean like when they're home alone. Mia: Right. So for example, and you know, everybody's dog is different. Everybody's cat is different. So if you can leave them unsupervised with like a kiddie pool or a pool, then fine. But you know, that's something that I always worry about cause you know, we hear a lot of stories. Dr. J: Yeah, well definitely not a regular pool. I certainly wouldn't give a dog access to a regular swimming pool with without observation. But yeah, a kiddie pool that's just filled a little bit should be perfectly safe. Of course, not necessarily for a puppy or a tiny dog. But if dogs can have access to, let's say to the yard, either while you're home and they're just out in the yard or if you're away from home and you leave them out in the yard, you really have to make sure that they've got reliable shade. So you know, not just one tree where maybe it gives some spotty shade. They really need reliable shade. So if you don't have trees or something blocking the sun — and don't forget, obviously the sun will change position in the sky as the day goes on — they might lose that shade. Giving them some sort of tent covering, something to provide reliable shade during the day with good ventilation is important. Making sure they have plenty of water, access to plenty of fresh drinking water and ideally not just in a bowl that they could easily tip over and then they're without water. There are some, I think, that can be mounted to the hose bib on the side of your house that will automatically refill as well. So maybe looking into something like that. There are some bowls that have a little perimeter thing that you can freeze so it can help to keep the water cool. Another thing that I love to do, which also gives them some mental stimulation and improves their hydration, is to actually pre-freeze a few metal water bowls, so fill about halfway and you can even put in some of their favorite treats or some of their wet food. Or a really fun thing to do is to stuff a Kong. So put a little bit of peanut butter in there. Obviously peanut butter without Xylitol. Put a little bit of peanut butter in there or some wet food, some treats — stuff that, and put it in the bowl, the water bowl before you freeze it. And then it's like a little treasure hunt for them that gets them really licking at the ice in the bowl to get to those stuffed toys or the treats. And that can provide anywhere from several minutes to even an hour of entertainment for a dog. Which is great! And one thing, I guess I should probably remember, I think it was a couple years back, but it may pop up again this year on social media. There was a big concern where giving dogs ice water can cause bloat. It's not the case in and of itself. Ice water doesn't cause bloat and dogs. We have an article that I wrote several years back when this first popped up, debunking that and talking about the reasons why. Mia: When we've given any preventive advice about ice, it's generally more for the teeth, right? Mia: So same as for me. Dr. J: Yeah, exactly. And my daughters who are six and eight, I hear them crunching the ice, it's like, ah, don't do that! Mia: Yeah, it's difficult. You know, the second that a cube falls from our ice cube tray, Marshall and Mazel come running in. It's like their favorite thing. So what can you do? I'm just glad to know that it doesn't cause, you know, anything worse than...I mean not, not to say that the dental damage is good. Dr. J: Yeah, a cracked tooth would not be fun but bloat can be immediately or very quickly devastating. So, we want to try and prevent that obviously, but fortunately giving ice water in and of itself does not cause bloat. Mia: You also mentioned reliable shade. 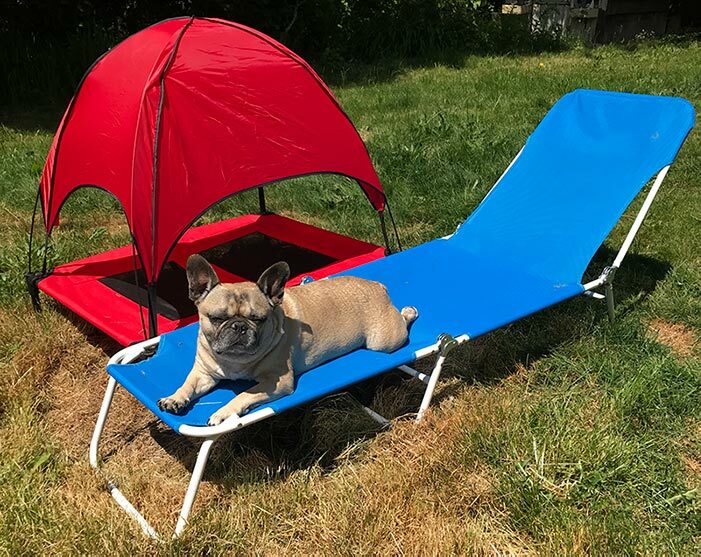 I got, speaking of the Frenchie board that I'm on, there was somebody that posted this canopy bed and so basically all of us went out and bought it right away (literally, it's been sold out now for a couple of months). And I got mine together and everybody else is posting all these pictures of their Frenchies enjoying it and being all shaded, and there's Marshall just sitting next to it, he won't go in. So you also have to like, you have to know your dog. Dr. J: Boy, whatever product manufacturer figures out something that Marshall really likes, that's going to be marketing gold because Marshall is clearly very difficult to please and get interested. So there you go. He's their ultimate a tester. Mia: Another product recommendation, I suppose, that I'll throw out there, although another one that he didn't like or even attempt to use until Mazel, our cat started using it — and he learned how to use it and loves it right away — are cooling pads. I can't, for the life of me, really understand how it works because you don't throw it in the freezer or anything like that. They lay on it and it automatically cools. And Mazel has used it numerous times. And then the only time that Marshall was interested in it was when he was trying to kick Mazel off of it. But those work well. Dr. J: Well, and also you were talking about those sort of cots or hammock beds for dogs. Those could be nice because they're up off the floor so you can get some more air cooling and air currents. So that can certainly help as well. And then of course for dogs that are inside, if you've got the ability to do air conditioner, leave that running or fans, is great. One other thing, and not necessarily related to the heat, but one thing a lot of people will do when the weather gets nicer, is open up windows. And having done my internship in New York City with a lot of high rises, we used to see a lot of cases of high rise syndrome, specifically in cats, but also in very unfortunate dogs. So I always want to just make sure that people are aware, if you're going to open windows, having well-fitted, sturdy screens, taking care to close them when you leave the house. But it's not just a city issue, because cats that fall from windows, anything from two stories up can get injured and ironically, or perhaps counterintuitively, the injuries that happen when a cat in particular falls from a window that's either two to seven stories high, are significantly worse than the injuries they sustain when they fall from a height greater than seven stories. So again, it's not something that people intuitively think would be the case, but it is. And they had gone back and looked at the records at AMC, in New York City, where they see so many cases and realized that that was the case. And that article that I wrote actually has a really cool video, I think it was done by National Geographic, that talks about why that might be the case in terms of from a physics standpoint. But not like a boring physics standpoint because, my apologies to all the physicists down there and I love what you do, I just don't have the brain power to do it. So people should check that out. And also just be really careful when opening windows around pets. Mia: Let's talk about some other maybe like treats or something that we can give them to cool down. I have a Frosty Paws in my freezer, one of those cute little ice cream cup kind of deals, I've been waiting for Marshall to be able to enjoy it. You can also make your own ice cream treats, ice cream, I guess not ice cream but yogurt, and obviously make sure not to use anything with Xylitol in it or anything like that. But I think we actually did an experiment last summer with that, so I'll have to try to find the recipe and hopefully link to it. If I can't find ours, I know I can find another. But I thought that that was a really cute thing to do. Sometimes I also will just reach for um, like some frozen peas or some frozen green beans because Marshall loves those, and that's always just a fun little snack to give him to cool him off as well. Dr. J: Yeah. And, then the other thing is, if we're talking about sort of making sure that they are hydrated, which we should talk about, you know, even just flavoring their water. So like for cats, a little bit of tuna juice or low sodium clam juice. For dogs, same type of thing. Or if you boil some chicken using that water to kind of flavor it can be beneficial just to get them to drink more water. But the easier thing to do, is if they're not already eating some canned food, start adding some canned food to their diet. Which I personally feel is particularly important for cats, specific types of canned food, but that's a whole other topic. But you know, even for dogs and you can talk to your vet about a low calorie or an easily digestible canned food that you could easily mix in, but that then introduces some more moisture to them and then you can add some water to it too, to increase the amount of water that they're taking in throughout the day, which can help them regulate their body temperature better. Mia: I guess I'm lucky because Marshall and Mazel are very well-hydrated. They love, I have one of those water fountains, and I think that's something that a lot of people should look into, because I know that it's something that is supposed to really attract cats, especially, to get them drinking more often. And every cat that I've ever lived with that has had it available to them has really enjoyed it. So if you have a cat that you're worried is may be a little dehydrated and isn't drinking from their bowls so much, I would definitely recommend getting one of those fountains. Dr. J: Well and hydration is obviously very important when we're talking about helping them regulate their body temperature. But in cats in particular, well I guess in dogs too, but in cats because they, especially male cats, tend to get a really nasty condition called Urethral or Urinary Obstruction, hydration is ridiculously important. And so the water recirculators are a great recommendation here. Also very pertinent there, so you get a lot of benefit from a urinary tract health, by getting your cat to drink more water. Now, of course if you're listening to this and your cat, you're like, my cat drinks a ton of water like he's attacking the faucet whenever I turn it on. He's drinking out of the toilet bowl, he's, every glass I put down and you think your cats' drinking too much. that could actually be an indication of an underlying medical problem like kidney disease or diabetes or an overactive thyroid or a bunch of other things. So if you think your cat is drinking to excess, not necessarily alcohol, but water, have it checked out by your vet because that can be a problem. Well that's a whole other problem too. So get them to your vet as well. 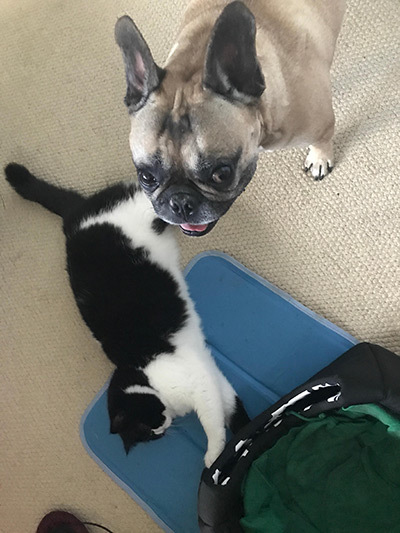 Mia: So, speaking of cats, how do we — this is something that I've always really wondered about and especially now having a cat that is also brachycephalic — how do we know whether our cats are overheating and is there anything special that we can do for them? You were actually just interviewed actually, by Catster, talking about whether or not cats sweat — spoiler alert: they do. Not in the ways that we do. And same as dogs, they have their own methods, you know, with panting and everything. So is there anything, I guess special to look for in cats? Especially if behavior is tied to it, I think it would be really difficult, I guess to know whether or not our cats are necessarily a little more lethargic. Different than dogs obviously. Dr. J: Yeah, I mean cats, fortunately cats are pretty smart in that respect. I mean dogs, especially Labs and a lot of the working dogs, they will work themselves to exhaustion and the point of death just because they're psyched to be out running and they want to please you and they want affection. They want all those things. Cats for the most part, again, I mean not that cats don't like to please us, but you know, they're also, I guess they're just a little bit smarter in that respect. In that, in the heat they're not going to overexert themselves because it's dangerous. So I don't know if that whole thought process goes through their mind, but generally speaking, when the weather gets hotter, a lot of cats will seek out shade. Even outdoor cats will go hide under cars or they'll go hide under decks or things of that nature where it's cooler. And in the house they'll search out tile floors, or linoleum floors, or wood floors that maybe are a little bit cooler to the touch. Although you'll always have a few cats that will still lounge in the window sill or in the sun coming through the glass patio door. But generally speaking, they'll search out cooler spots. Cats will pant, but typically not until very late in the overheating process. And oftentimes if you see a cat that's panting, you've got to also be thinking about pain, stress, anxiety, a lung or respiratory problem, any number of other conditions. So if you see a cat that's panting and especially doing it often, they really need to be evaluated by the vet. But one of the things that cats will do, very interestingly, and they do sweat a little bit from their paws, it's not really great at cooling them, but cats will also oftentimes increase their grooming behavior. Because when they put saliva, in the process of grooming, when they put it on their coat, as that evaporates, that can help to cool a bit as well. So cats predominantly stay cool or cool themselves by not exerting themselves too much in the heat. In searching out cooler spots, and then increasing grooming behavior is another method that they have of doing so. Mia: Okay, great. And we can obviously help them with some of the grooming...if they'll let you hold them for long enough. Dr. J: Yeah. Well, and one thing a lot of people ask when the summer comes, is should they clip their dog or their cat's coat. Like should they give him a lion cut. And more often than not, no. Mia: I'm so happy you mentioned this because my fiancee would really like to give Mazel a lion cut, and I'm like, no. Dr. J: It can be ridiculously cute. But their coat is designed to help protect them both in heat and cold. And it can also help protect their skin from sunburn or even developing skin cancer. So a lot of these, you know, Northern breed dogs, and the dogs that really blow a lot of undercoat as the weather starts warming up, definitely brush them, get that out of there as much as possible, the undercoat — but leave their regular coat for the most part because it can have a protective effect and an insulating effect, both to help keep them warm in the winter and cooler in the summer. Mia: Well, as another quick tip, I always carry a bottle of water for Marshall on our walks, but in the summer I carry an extra bottle of water just to pour down his back and neck at different times, I always try to keep enough to put on him at different parts of the walk and get it really down his back and on his neck and under his belly and in his arm pits. So that's just a really easy way to help with the cooling down. Dr. J: Well, I mean, as you put water on them and it evaporates, that can be cooling. So you know, just because they don't sweat, you're still mimicking that because that's what sweat does, right? We do it, they do it to a lesser extent in different spots. But when you sweat it puts moisture on your skin, which then evaporates as long as the humidity around you isn't too high and the temperature's high enough, it evaporates and then that creates a cooling effect. So putting water on them can be beneficial. Just be careful not to get it in their ears. Don't set them up for an ear infection. But that can help. And certainly when we have overheated dogs and cats, that's one of the things we do is we get some cool water — and you don't want to use ice water because that'll actually constrict those skin blood vessels and can actually cause an inability to get rid of heat. So you don't want to do ice water you don't want to merge them. Mia: I am really glad that you mentioned that. So it's got to be lukewarm water. I mean, cool water? Not the cologne? Dr. J: Yeah I mean hose, water, whatever. Not the cologne? Ha! Yeah, no, you certainly don't want ice water. You don't want to put them in a tub of ice water or anything like that because that will constrict those blood vessels and make it more difficult for them to get rid of excess heat. Putting even like a cool wet towel on them can help as well to some degree. Giving them water to drink, not forcing it down their throat, not forcing them to drink it, not letting them drink too much at a time, but giving them water to drink. If you've got an overheated pet, the first thing you should do is get them out of the sun, move them to a spot with shade and ideally not on a hot surface. Don't put them on the asphalt, the sidewalk where they're going to get radiant heat from below. That could potentially even cause thermal burns, but certainly it's going to be contributing to their heat gain. Mia: I want to touch on two different things. A moment ago you had mentioned that you shouldn't let your dogs just drink all the water they want. Can you talk about why that wouldn't be a good idea and how to know when it's too much? Dr. J: For a couple of reasons. The primary one really, is that if they drink too much, too quickly, that can cause a distension of their stomach, and that could itself lead to bloat, or some degree of discomfort and stomach distention. But also that could cause them to vomit or regurgitate, which definitely is not desirable when you've got a dog that's overheating. But also, if they drink too much too quickly, and then they absorb too much too quickly, that can cause some metabolic and acid base disturbances within their body. So you don't want to give them too much water too fast. Dr. J: So their consciousness. So sort of going back to that obtundant thing, where they're just, neurologically, they're not right. And so if you dump water down their throat in the process of getting it down their esophagus and into stomach, you may also be getting it into their windpipe, under their trachea and into their lungs. And now you're setting them up for pneumonia on top of that and they're just, that's going to be a bad scenario. Mia: Uh, yeah. Yikes. That does not sound good. And then the second part of that, you had said don't put them on the asphalt, or something like that, which I think we need to maybe go a little bit further into and say, even if they aren't having a heat stroke, pay attention to what the sidewalk that you're walking on feels like, what the asphalt feels like. I mean, that's definitely something in New York that I had to really pay attention to because our feet are covered with shoes most of the time when we walk outside. So really it would be good to go out, take your palm to the surface and really see what it is that your dogs are walking on. Dr. J: And if you can't leave it there for, there's all kinds of numbers sort of floating around, but three to five seconds, and if it's uncomfortable for you, you really got to consider, that's probably going to be really uncomfortable for your pets. And dangerous. So fortunately there are some good dog boots that are out there. You would want one with like a good sturdy rubber protective soul. And Ruffwear makes some great ones. There's other companies that make good ones. It's a big thing, especially in the summer, a lot of people will go to say street fairs and bring their dogs. And so you've gotta be really careful there. And then the other place where a lot of people don't think about it, is at the beach. So if you bring your dog with you to the beach. And it's funny that people don't think about it because we all step on the sand and if it's too hot, first thing we do is put down the cooler, like lay towels, you know, along the way. Dr. J: Or put our shoes back on. But none of the dogs can do any of those things. So people think, dogs are in the ocean, they're protected, they're not going to suffer from heat-related problems. But it's a huge area where they could, because of, paw pad burns from the sand, exposure to the sun, and even, potentially drowning in the ocean. And especially if you're in an area that's got rip currents. Or even drinking the salt water from the ocean. Or if you're at the lake and blue green algae, again, a whole other podcast topic. Yeah, it's like a to do list. We do one thing and come up with five other things to do. Mia: Well, there's a lot to be aware of and the awareness is really the only thing that helps. I mean, because it's, it's devastating. I told you right before we started recording today, it feels like every time I open up social media, an animal has passed that I'm following, which is, it's terrible. And actually, the most recent one now was a Frenchie who just passed of heat stroke and it was a family that has a ton of Frenchies. They know things, they are loving, they are educated, but it still happens. Dr. J: It does. I mean, I always say to people you can't prevent what you're not aware of. Raising awareness is crucial. And then ideally getting some, reliable, practical, actionable tips to help minimize the risk. And then also knowing what to look for so that if the problem does happen, you know how best to respond and take it from there. 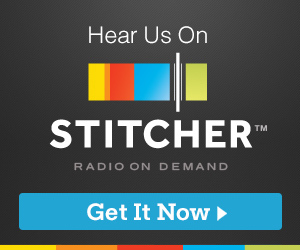 If people have questions after listening to this or at any point, reach out to us and ask. And we'll do our best to answer them. Obviously no emergency questions, or specific medical questions for your pet, because I just can't answer those legally. But you know, general questions or things that you're curious about or topics you want us to cover. Definitely. We're all ears. Mia: Reach out and sharing is caring, which is why we are sharing this information. So thanks again Dr. J for helping us all keep our pets safe and healthy and I'll talk to you again soon. Dr. J: Sounds good to me. You have yourself a great day everybody. Thanks for listening and we'll catch you next time.